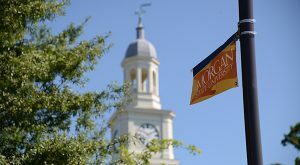 Morgan State University will create a blockchain program as part of a partnership with Silicon Valley fintech firm Ripple, the university announced Thursday. A five-year academic partnership with Ripple will allow Morgan to create the Center for the Study of Blockchain and Fintech Innovation at its Earl G. Graves School of Business and Management. The university did not disclose the amount of funding it would receive. Ripple is a fintech firm that allows users to send money globally using blockchain technology. Morgan’s partnership with Ripple comes through University Blockchain Research Initiative, a program that allows Ripple to partner with universities to support academic research, development and innovation in blockchain, cryptocurrency and digital payments. Ripple provides these universities financial and technical resources. It also collaborates with faculty and students on research and technical projects. The initiative was launched in 2018 and supports 29 universities. Eleven universities were added Thursday. Other universities announced today as part of the UBRI include: Carnegie Mellon University, Cornell University, Duke University, Georgetown University, University of Kansas, University of Michigan, National University of Singapore, Northeastern University, University of Sao Paulo, and Institute for Fintech Research at Tsinghua University.